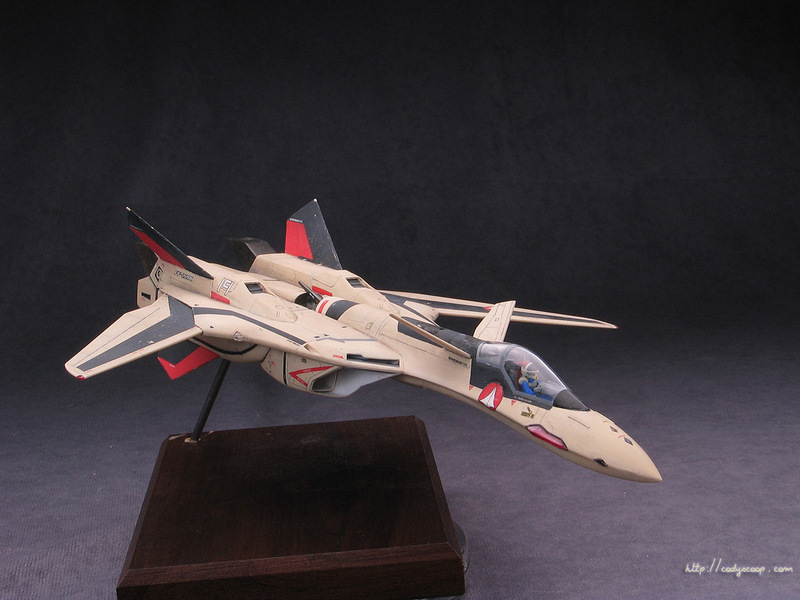 YF-19 is Macross Plus’ protagonist Isamu’s ride. The forward wings gives it a unique look, and is one of Kawamori’s best designs. Hasegawa did justice to the design, again came up with the best rendition of this turkey. This is perhaps one of the easier kits in the line, with parts very well divided subassemblies. This time I used technical pencil to do panel lines, and I like the results a lot. The lines tends to be subtle and not overwhelming, and the application is easier as well. Decaling however turned out again to be my undoing. I saw great remarks about using Future as a “decal solvent” so I thought I’d give it a shot. But I also apply Super Sol on top, and it appears to wrinkle the decals like crazy; took me several hours to fix 🙁 For this kit, I’d advice to do away with the black linings for the legs; they are hard to apply and painting the grooves isn’t really that much work. Future isn’t really a ‘solvent’ for decals but it provides a very smooth glossy finish so that there is less chance of the decal ‘silvering’ due to air being trapped between the decal and the surface. Also my understanding is that Super Sold will cause the decals to wrinkle initially but they’re supposed to flatten out after a while when it all dries. haven’t used it so I’m not speaking from experience. Bird turned out pretty sweet tho! Dude I know all these 🙂 I was reading Hyperscale and some people claimed that they can do away with these decal solvents using just Future alone, so I thought I’d give it a shot. Perhaps I haven’t mastered the technique, it didn’t “tuck in” the decals too well as the decal solvents, so I turned to Super Sol. But it was a bad idea, I think the Sol wrinkled the decals but the Future coat prevented the unwrinkling. Or at least that’s what I thought happened. Thanks… I don’t have any bleeding problems with pencil; I can’t imagine why it would since graphite is insoluble to most stuff?! A really beautiful model-great paint job! !